The research concludes that more work needs to be done to understand the strengths and weaknesses of Enterprise 2.0 technologies such as Wikis so that they can be used appropriately. The paper is structured as follows: section 2 provides an overview of the existing Enterprise 2.0 technologies in use as mechanisms for encouraging knowledge sharing between organisational participants. The rationale behind the selection of Mediawiki as the technology used to improve knowledge sharing within the organisation in this case study is detailed in section 3. Section 4 outlines the features included in the Wiki that was implemented. Section 5 reports the analysis of the usage statistics for the Wiki. The main reasons behind the lack of success of the Wiki as a knowledge transfer strategy in this case are explored in section 6, highlighting that these may also apply to other organisations. Wikis. Software that allows users to freely create and edit Web content using a Web browser. Given their relevance in the context of this research, Wikis will be referred to in more detail later in this and other sections. Social Bookmarking: A form of tagging done by individuals to communicate context and categorisation of information and knowledge resources that may not have been seen through a more formalized taxonomy-driven viewpoint. These principles have been implemented in a large number of knowledge sharing environments with a significant degree of success, according to Mika (2005). Collaborative Filtering: A method of determining the relevance of information and knowledge resources according to the actions of individuals. These systems often record the browse and search behaviours of users in order to assess the “value” of resources (Hahn and Subramani 2000). Social Networking: Dynamic “relationship” building, person-to-person connections – not necessarily "community" or collaboration. Facebook and LinkedIn are prime examples of consumer-facing Social Networking sites, now being implemented at intra-organisational level in many organisations. 2.1 Wikis: success and failures Enterprise 2.0 tools supporting a common information space include Blogs, RSS, and Wikis. Although the first two of these have also been considered successful Enterprise 2.0 technologies, they are less relevant to knowledge elicitation and transfer. However, this is not the case for Wikis. Wikis are particularly relevant as they allow contributors not only to post information into a public space but also collaborate in building a knowledge base by editing content that have been posted by others in the Wiki platform. As a result, Wikis have been exploited by many organisations for knowledge sharing. Particularly successful has been the case of Sun Microsystems. Brown (2008) argues that – along with an extensive program for the training of staff in the use of the tool, Wikis have been developed and used as project management tools and community builders at Sun Microsystems, resulting in a significant step towards the implementation of further Enterprise 2.0 in that organisation. Other successful initiatives have been recently reported. Wikis have been developed to support knowledge sharing in a wide range of projects not only within the scope of knowledge management (Selhorst, 2008) but also in related areas such as teaching and training (Raman et al., 2005) and the development of social networking strategies (Hustad and Teigland, 2008).. These have been encouraged by the result of studies such as that of Majchrzak et al. (2006) which, taking into account issues such as length of existence, number of users and frequency of accesses, concluded that corporate Wikis are sustainable. However, the literature shows almost no sign of negative experiences concerning the implementation of Wikis in organisations. Nevertheless there is increasing concern regarding the importance of formulating a coherent foundational theory for the use of Wikis in organisations (Majchrzak, 2009). 3. 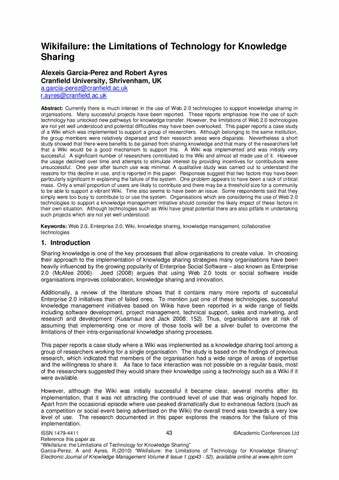 The need for a Wiki as a knowledge sharing technology in a research environment This case study was carried out in a research-oriented organisation among a group of researchers who were mainly working in areas such as engineering, applied science and management. The investigators undertook a study to see how these researchers exchanged knowledge and expertise and whether it could be improved. There are in the organisation approximately 35 full-time researchers, whilst another 150 are part of the organisation on a part-time basis or for a fixed period of time, usually one year. The organisation is structured in departments that, although geographically dispersed, conduct research on related areas. As concluded by Garcia-Perez and Mitra (2008), interviews with staff revealed a wide spectrum of knowledge available in the community. However, work was possibly being duplicated and researchers were not supporting each other as they believed they would if they were more aware of each others’ work. There was awareness of this problem at all levels within the organisation. However, because there was very little interaction among researchers on a regular basis, knowledge sharing was not taking place effectively. There was a tacit agreement among all researchers about the need for more knowledge sharing, and most of them recommended the use of information and communication technologies as an appropriate way to address the problem given the organisational context. In particular, they mentioned the need for a Wiki and agreed to share their full profiles and relevant knowledge if such a technology was put in place. The research reported here complements work conducted in 2007 with the aim of facilitating knowledge elicitation and transfer within the organisation using a Wiki. Some members of the community – including one of the authors of this paper, carried out the design and implementation of a Wiki as a collaborative, knowledge sharing tool within the organisation. The following sections describe the implementation of the Wiki and its adoption by the research community. Two of the researchers worked on the development of the first version of the Wiki from the beginning of 2007. This work involved the installation of Mediawiki, design of the interface and implementation of the above features. From April 2007, a larger team dedicated a significant amount of time to create as many pages as possible. By July 2007 the Wiki had begun to be known to the community. It had more than 100 pages with information covering all areas that had been mentioned by the community of researchers. Also, most of the features described above had been fully implemented, and these were supported by an interface that was designed to be attractive. The Wiki was formally launched to the community in August 2007 with an email to all full-time researchers as the initial target of the initiative. The email not only included a description of the Wiki but also an invitation to a launch meeting a week later. More than 30 researchers attended the meeting, including some that had recently joined the organisation. Judging from the discussion that took place, the Wiki was embraced by the community as the tool needed by the organisation. Also it was confirmed that the community was still willing to use the technology as their main knowledge sharing mechanism. However, its usage over the following 18 months was not as predicted. The following section describes what followed the launch of the Wiki. In order to have a clearer view of the number of visits, an additional graph has been created by truncating the number of visits that exceeded the number of 50 per day. The resulting graph is shown in figure 2 below. More than 13,000 of the total number of visits lasted less than 2 minutes. The sixth and highest peak took place in May 2008 and is associated with an attempt to stimulate use of the Wiki by running a competition as a recovery strategy. Are you aware of the Wiki and the resources it contains? Have you ever used the Wiki? If so, was it a positive experience? Are you using the Wiki at present? How could the Wiki be improved? To encourage people to visit the Wiki in the hope that increased familiarity with the Wiki would in turn lead to greater use. To stimulate the production of new Wiki entries in the hope that this would help to produce a critical mass of relevant material and information to establish the Wiki as a useful resource for the researchers. Figure 5: Number of visits per day before and after the end of the iPod competition (9 May 2008) Although statistics do not allow an evaluation of the quality of contributions made during the period when the iPod competition was run, a review of the Wiki did not show a significant difference in the nature of resources. Visits to the wiki did not always result in new pages added, and the new contents were heavily concentrated in the section related to social activities and dominated by photographs. The iPod competition failed to provide the expected results as a recovery strategy. The statistics during the following months (May 2008 until January 2009) show that the number of visits fell significantly over time. The following diagrams show the statistics for the last month being analysed. The statistics in Figures 6 and 7 show that by the end of the period being analysed the use of the Wiki declined to sporadic visits from a small number of visitors. Again one particular visitor accounted for almost all the visits. The initiative to stimulate use of the Wiki had thus not been successful. It is clear that in the short term the competition did result in a greatly increased number of visits and also encouraged a number of users to add a significant amount of further material. The fact that use declined sharply as soon as the competition was over suggests that there were other problems rather than lack of awareness of what it offered or researchers not having posted information to the Wiki. In certain conditions an Enterprise 2.0 technology seems to be an appropriate solution to the sharing of knowledge within the organisation. This case study was representative of this situation: a relatively small organisation formed by geographically distributed teams working on projects that were related in nature. Employees were very familiar with technologies and would be ready to adopt an organisation-wide strategy. All those who were involved with the design and implementation of the Wiki, as well as those users who had been interviewed prior to its implementation believed it would be successful. However, in practice the technology did not have the expected impact as a knowledge management strategy because employees did not use it as it was predicted. How the supposed ‘willingness to share knowledge’ is reflected in practice. The implementation of a Wiki should not be based solely upon employees’ claimed willingness to share knowledge. Even if a study suggests that employees will share knowledge using a Wiki it does not necessarily mean that they will do so. Even at basic levels such as contact details or areas of expertise, there are several issues affecting the number and nature of contributions to the knowledge base. These may include barriers that potential users and developers of the technology did not consider before the design and implementation stages. The importance of carefully planned strategies to design, launch and keep the technology working, that consider issues such as communication and group dynamics. A Wiki can be seen as a framework to be used by communities of interest that may emerge and dissolve over time. Trying to force continuity of usage by a particular community that has changed its nature may have negative long term effects. Any recovery strategy should seek to encourage contribution and use of valuable resources. Enterprise 2.0 technologies such as Wikis may provide the expected results in the elicitation and sharing of knowledge in certain conditions. However, they do not always work as expected. There are important challenges associated to the knowledge elicitation and transfer process. The work reported in this paper suggests that there are reasons to be cautious in the implementation of Enterprise 2.0 tools. Even when the knowledge management team is working on fertile ground (e.g. users recommend the implementation of the technology and claim that it would be widely used), organisations cannot assume that implementing something like a Wiki is a solution to the problem of knowledge elicitation and sharing. Acknowledgement The authors would like to acknowledge the valuable help of those who worked on the design and implementation of the wiki, in particular Dr Chris Hargreaves and Dr Benoit Mangili. References AIIM – Association for Information and Image Management (2009), “What is Enterprise 2.0 (E2.0)?” [online], http://www.aiim.org/What-is-Enterprise-2.0-E2.0.aspx Brown, S. (2008), “Wikis at Sun Microsystems: The Ongoing Evolution. Find, Use, Manage and Share Information (FUMSI)”, [online], http://web.fumsi.com/go/article/share/3328 Davenport, T. H. and Prusak, L. (1998), Working Knowledge. Harvard Business School Press, Boston, Massachusetts Deep Software. (2009), “Deep Log Analyzer: A Web Analytics Software”, [online], http://www.deepsoftware.com/?ref=dla Garcia-Perez, A. and Mitra, A. (2008), “Tacit Knowledge Elicitation and Measurement in Research Organisations: a Methodological Approach”, The Electronic Journal of Knowledge Management. Volume 5 Issue 4, pp 373 – 386. Hahn, J., and Subramani, M. R. (2000), “A Framework of Knowledge Management Systems: Issues and Challenges for Theory and Practice”, Proceedings of the 21st International Conference on Information Systems. Brisbane, Australia. pp 302-312. 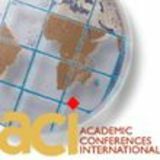 Hustad, E. and Teigland, R. (2008), “Implementing Social Networking Media and Web 2.0 in Multinationals: Implications for Knowledge Management”, Proceedings of the European Conference on Knowledge Management. Southampton, UK. pp 323-331. Jeed, M. (2008), “Can applying Web 2.0 to an organization make it faster, better? It’s certainly making for more collaboration and knowledge sharing”, AIIM E-DOC Magazine, January-February, [online], https://www.aiim.org/Infonomics/ArticleView.aspx?ID=34208 Kussmaul, C. and Jack, R. (2008), “Wikis for knowledge management: Business cases, best practices, promises and pitfalls”. In: Lytras, M. D., Damiani, E. and Ordonez de Pablos, P. (Eds). Web 2.0: The Business Model, Springer, US. pp 147 – 165. Majchrzak, A., Wagner, C. and Yates, D. (2006), “Corporate wiki users: results of a survey”, International Symposium on Wikis (WikiSym 06). Odense, Denmark. Majchrzak, A. (2009). Comment: Where is the theory in Wikis? MIS Quarterly, Vol. 33. No. 1. pp 18-20. McAfee, A. P. (2006) “Enterprise 2.0: The Dawn of Emergent Collaboration”, MIT Sloan Management Review. Vol. 47. No. 3. pp 21–28. Mika, P. (2005) “Ontologies are us: A unified model of social networks and semantics”, Proceedings of the 4th International Semantic Web Conference (ISWC 2005), Galway, Ireland, [online], http://www.cs.vu.nl/~pmika/research/papers/ISWC-folksonomy.pdf Raman, M., Ryan, T. and Olfman, L. (2005) “Designing Knowledge Management Systems for Teaching and Learning with Wiki Technology”, Journal of Information Systems Education. Vol.16. No. 3. pp 311–320. Selhorst, K. (2008) “Putting ‘Knowledge Management 2.0’ Into Practice – The process of setting up a Wiki as a Knowledge Management tool in a Public Library”, Proceedings of the European Conference on Knowledge Management. Southampton, UK. pp 807-816. Wikipedia. (2009) “About Wikipedia”, [online], http://en.wikipedia.org/wiki/Wikipedia:About Yehuda, G., McNabb, K., Young, G.O., Burnes, S. and Reiss-Davis, Z. (2008) “Wikis and Social Networks are ready to deliver high value to your Enterprise”, Forrester TechRadar™ for I&KM Pros: Enterprise Web 2.0 for Collaboration. Q4 2008.